SSP would like to thank the following organizations for their support of Intel ISEF 2018. Additional organizations will be added as their affiliation is completed. The American Committee for the Weizmann Institute of Science, founded in 1944, develops philanthropic support for the Weizmann Institute of Science in Israel, one of the world's premier scientific research institutions. The Dr. Bessie F. Lawrence International Summer Science Institute at the Weizmann Institute provides students with a unique opportunity to participate in hands-on studies in professional academic laboratories at the forefront of scientific research. AGI was founded in 1948, under a directive of the National Academy of Sciences, as a network of associations representing geoscientists with a diverse array of skills and knowledge of our planet. The Institute provides information services to geoscientists, serves as a voice of shared interests in our profession, plays a major role in strengthening geoscience education, and strives to increase public awareness of the vital role the geosciences play in society’s use of resources, resilience to natural hazards, and the health of the environment. The American Institute for Aeronautics and Astronautics is committed to inspiring the next generation of aerospace professionals by recognizing exceptional students at all levels. We encourage students’ progress through STEM-based educational programs, design competitions, scholarships, and awards such as the AIAA "Look Up!" Award, debuting at this event. We will award a cash prize for the top three aerospace-related projects. We encourage students to Look Up! and see their future in aerospace. The American Mathematical Society was founded in 1888, to further the interests of mathematical research & scholarship, as well as to serve the national/international community through its publications, meetings, advocacy & other programs. Friends and family of the late mathematician, Karl Menger, contribute to a fund in his memory, to be distributed by the AMS for annual awards at the Intel International Science and Engineering Fair. The American Physiological Society (APS) is a nonprofit devoted to fostering education, scientific research, and dissemination of information in the physiological sciences. The Society was founded in 1887 with 28 members and today has more than 10,500 members. APS participates as a Special Awards Sponsor for the Intel ISEF. Each year, the APS recognizes outstanding high school research projects in life sciences. Four students receive cash awards and a year's subscription to the APS journal, "Physiology." The American Psychological Association is the largest scientific and professional organization representing psychology in the United States. APA is the world's largest association of psychologists, with over 117,500 researchers, educators, clinicians, consultants and students as its members. APA’s mission is to advance the creation, communication and application of psychological knowledge to benefit society and improve people's lives. The American Statistical Association is the world's largest community of statisticians. The ASA supports excellence in the development, application, and dissemination of statistical science through meetings, publications, membership services, education, accreditation, and advocacy. Our members serve in industry, government, and academia in more than 90 countries, advancing research and promoting sound statistical practice to inform public policy and improve human welfare. Arconic Foundation supports programs that help prepare the 21st century engineering and advanced manufacturing workforce. Arconic Foundation is an independently endowed foundation with assets of approximately $320 million and is the charitable arm of Arconic Inc. – which works in close partnership with customers to solve complex engineering challenges to transform the way we fly, drive, build and power. Through collaboration with our nonprofit partners, Arconic Foundation initiatives make quality STEM education opportunities available to students, support engineering and technical skills training, and help to create access for underrepresented individuals to the STEM fields. ACM is widely recognized as the premier membership organization for computing professionals, delivering resources that advance computing as a science and a profession; enable professional development; and promote policies and research that benefit society. ACM hosts the computing industry's leading Digital Library and serves its global members and the computing profession with journals and magazines, conferences, workshops, electronic forums, and Learning Center. AAAI is a scientific society devoted to advancing the scientific understanding of the mechanisms underlying thought and intelligent behavior and their embodiment in machines. AAAI promotes research in, and responsible use of, artificial intelligence, as well as public understanding of artificial intelligence. AAAI also strives to improve the teaching and training of AI practitioners, and provide guidance on the importance and potential of current AI developments and future directions. Carnegie Mellon University has been a birthplace of innovation since 1900. The Leonard Gelfand Center creates on-campus and community-based opportunities for CMU faculty, students and staff to improve educational opportunities for youth, especially in the areas of science, technology, engineering and mathematics education. Mechanical Engineering faculty and graduate student judges will select three projects for the Energy Innovation Award. The Coalition for Plasma Science is a group of institutions, organizations, and companies joining forces to increase awareness and understanding of plasma science and its many applications and benefits for society. Drexel University will award eight full scholarships valued at $250,000 each to those students whose projects match Drexel's curriculum. Drexel is recognized for its focus on experiential learning through co-operative education, its commitment to cutting-edge academic technology and its growing enterprise of use-inspired research. Drexel Co-op enables students to balance classroom theory with practical, hands-on experience. Florida Institute of Technology is a nationally ranked, doctoral-granting research university. Promoting “High Tech with a Human Touch” the university offers degrees in engineering, science, computing, aeronautics, business, psychology and liberal arts. Its location just south of the Kennedy Space Center provides incredible research opportunities for students interested in engineering and science. 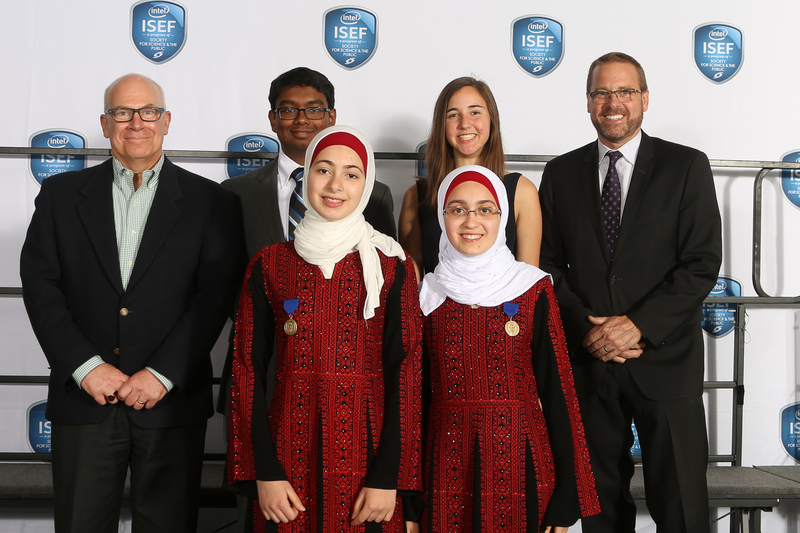 FIT will offer three presidential scholarships to INTEL ISEF participants that equal full tuition each year for four years upon fulltime enrollment at the university. The Bruno Kessler Foundation (FBK) is a leading research center in Trento, Italy. WebValley is the FBK Summer School program for interdisciplinary scientific research. A team of enthusiastic and motivated high school students and FBK researchers accepts a project challenge, proposed by a visiting scientist. FBK's Board of Directors will award several Intel ISEF finalists full fellowships, 1 of them to include travel to Italy, to be part of the WebValley team in June. GoDaddy is the world's largest technology provider dedicated to small business. GoDaddy believes it has a responsibility to make a difference in the community. As part of that philosophy, GoDaddy contributes to nonprofit organizations that focus on causes meaningful to customers, employees and to our community. GoDaddy will be presenting the following awards: the Web Innovator Award, the Mobile Application Award, the Open Source Award, the Data Award and the Forward Thinker Award. IEEE is the world's largest professional association dedicated to advancing technological innovation and excellence for the benefit of humanity. IEEE awards the $10,000 Presidents' Scholarship to recognize a deserving student for an outstanding project demonstrating an understanding of electrical engineering, electronics engineering, computer science, or other IEEE field of interest. In addition to the scholarship, IEEE awards a $600 Second Place Award and a $400 Third Place Award. This award is presented by the family of Krishnamurthy Soumyanath (1957 - 2010), for the best project in Computer Engineering. Dr K. Soumyanath was an Intel Fellow and held the title of Chief Architect, Integrated Platform Research at Intel Labs, USA. He led research and development in circuits and architectures for next-generation transceiver devices. The prize honors the memory of an energetic and adventurous individual who inspired and mentored many young people to excel in all aspects of life. King Abdulaziz & His Companions Foundation for Giftedness and Creativity, "MAWHIBA”, is a national educational foundation in Saudi Arabia established to help cultivate a comprehensive environment of creativity. The organization seeks to build a sustainable future by encouraging youth to search for creative means toward developing concepts in exciting up and coming fields of study. To support this goal, MAWHIBA will award prizes in four distinct categories that include innovative technology, medicine, water technology and cyber security. There will be fourteen students chosen to receive awards. Mu Alpha Theta strives to promote the enjoyment and scholarship of mathematics. The Mu Alpha Theta Award is given to the most challenging, thorough, and creative investigation of a problem involving mathematics accessible to high school students. Components of the investigation often include mathematical proof, mathematical modeling, statistical analysis, visualization, simulation, and approximation. The National Aeronautics and Space Administration (NASA) is the United States government agency responsible for the nation's civilian space program and for aeronautics and aerospace research. Founded in 1958, NASA drives advances in science, technology, aeronautics, and space exploration to enhance knowledge, education, innovation, economic vitality, and stewardship of Earth. Since 1929, the National Anti-Vivisection Society has promoted greater compassion, respect and justice for animals. NAVS educational and advocacy programs advance better, more humane science; support the development of alternatives to the use of animals in research, testing and education; and effect changes which help to end the unnecessary suffering of animals. Junior Academy of Sciences of Ukraine is an educational system under the auspices of UNESCO that aims at providing the organization and coordination of students’ research activities, creating conditions for their intellectual and creative development, spiritual advance, and vocational self-determination to engage children in discovery and creation.We would like to honor Intel ISEF Finalists Special Awards whose projects will be in alignment with United Nations Sustainable Development Goals. The Addiction Science Award is given by the National Institute on Drug Abuse (NIDA) and the Friends of NIDA, (a group that supports NIDA's mission) to three exemplary projects on the topic of addiction science. The National Security Agency's Research Directorate secures the future by conducting ground-breaking research in a wide variety of science, technology, engineering, mathematics and cybersecurity areas. This research provides tools, technologies, designs, and methodologies to safeguard cyberspace interactions. These Special Awards presented at ISEF promote study and research in scientific fields that can assure and protect cyberspace interactions in an increasingly interconnected world. The Naval Science Awards Program (NSAP) is a U.S. Navy and Marine Corps program that encourages our nation's students to develop and retain an interest in science and engineering. NSAP recognizes the accomplishments of eligible students at regional and state science and engineering fairs and the Intel International Science and Engineering Fair (ISEF) in producing and presenting quality science and engineering projects. Oracle Academy, is the flagship program under Oracle’s corporate social responsibility education pillar. Our mission is to advance computer science education and make it accessible to students globally to drive knowledge, innovation, skills development, and diversity in technology fields. Each year, Oracle Academy reaches more than 3.5 million students in 120 countries. In our past fiscal year, we delivered nearly US$3.75 billion in resources to help prepare students for life and work in our modern technology-driven global economy. The PTOS is a membership-based organization for Patent and Trademark professionals and other interested individuals. From its inception in 1917, the Society has been dedicated to the improvement and appreciation of the United States Patent and Trademark Systems through promoting the systems' growth and well-being, as well as promoting the social and intellectual welfare of the Society members. Ricoh is empowering digital workplaces using innovative technologies and services enabling individuals to work smarter. For more than 80 years, Ricoh has been driving innovation and is a leading provider of document management solutions, IT services, commercial and industrial printing, digital cameras, and industrial systems. Ricoh has a long-standing environmental mission and commitment to sustainability, bringing corporate, social and environmental responsibilities into balance. SAMVID Education Foundation, a non-profit organization officially launched in 2017, is started to provide a platform for K-12 students and encourage them in honing their academic skills in STEM areas of specialization. The foundation will provide them with resources to explore science project ideas that help in cultivating an interest in scientific research, a first step in their pursuit to becoming creative and innovative scientists and take on challenges in successfully advancing scientific thinking. The Shanghai STEM Cloud Center is the very first STEM education center in China that provide diverse programs for schools, teachers and students. Cooperated with professional societies, associations, research institutions in STEM field, the mission of our center is to encourage students to study Science, Technology, Engineering and Mathematics, and always be curious about the real world. Founded in 1886, Sigma Xi is the international honor society of research scientists and engineers, with a distinguished history of service to science and society. This multi-disciplinary society includes members who were elected based on their research achievements or potential, and historically, more than 200 members have won the Nobel Prize. The Society is pleased to offer awards for the best demonstration of interdisciplinary research. Society for Experimental Mechanics, Inc.
Taiwan International Science Fair Special Award. Thermo Fisher Scientific is the world leader in serving science, enabling our customers to make the world healthier, cleaner and safer. Thermo Fisher Scientific is pleased to recognize four awardees which represent our mission and our core business practices: 4i Values (Integrity, Intensity, Innovation & Involvement), PPI System (Practical Process Improvement), and Sustainability. USAID is the world's premier international development agency and a catalytic actor driving development results. USAID's work advances U.S. national security and economic prosperity, demonstrates American generosity, and promotes a path to recipient self-reliance and resilience. The U.S. Global Development Lab serves as an innovation hub. We take smart risks to test new ideas and partner within USAID and with other actors to harness the power of innovative tools and approaches that accelerate development impact. From nanomaterials a billionth of a meter in size to global climate dynamics, EPA scientists and engineers are investigating every scale of our environment and the links between environment and human health. EPA conducts research that addresses the highest priority science needs of the nation. The work performed by EPA scientists, engineers and their research partners improves the quality of the air we breathe, the water that sustains us, and the land upon which we live. University of the Sciences awards five $9,250 scholarships to students whose research and academic interests align with USciences' mission. Scholarships become effective upon enrollment in the incoming class of fall 2019. At USciences, we are building on a life sciences legacy started almost two centuries ago as Philadelphia College of Pharmacy. From leading-edge research and developing innovative treatments and cures, to improving lives worldwide, USciences is about moving life forward. West Virginia University will be awarding 7 Academic Excellence or Presidential Scholarships (depending on residency) to students whose research and academic aptitude align with WVU's institutional goals and research interests. Classified as a Research University (High Research Activity) by the Carnegie Foundation for the Advancement of Teaching, West Virginia University offers 184 undergraduate and graduate degree programs in 14 academic colleges. Founded by Stephen Wolfram in 1987, Wolfram Research is one of the world's most respected software companies—as well as a powerhouse of scientific and technical innovation. As pioneers in computational science and the computational paradigm, we have pursued a long-term vision to develop the science, technology, and tools to make computation an ever-more-potent force in today's and tomorrow's world.